But guerrilla marketing isn’t some sort of combative form of communication. After all, that would be highly disruptive, which violates the inbound methodology. In fact, it’s actually a very unconventional form of inbound marketing, in that it raises brand awareness among large audiences, without interrupting them. Because it’s so unconventional, however, it’s not the easiest concept to explain. Guerrilla marketing is often best understood when it’s observed, so that’s how we’re going to approach its best practices and takeaways here. We’ll start with some basics around where it came from and how it works, followed by an examination of how it’s been carried out successfully. When we hear the term “guerrilla marketing,” it’s hard not to think of guerrilla warfare — which makes sense, since that’s where this style of marketing got its name. In the warfare context, guerrilla tactics depend largely on the element of surprise. Think: “Ambushes, sabotage, raids,” according to Creative Guerrilla Marketing. But how does that translate into the work we do every day? In marketing, guerrilla techniques mostly play on the element of surprise. It sets out to create highly unconventional campaigns that catch people unexpectedly in the course of their day-to-day routines. You’ll see what that looks like in some the examples below. The term itself was created in the early 1980s by the late business writer Jay Conrad Levinson, who wrote several books about guerrilla tactics in a number of professional areas. Of course, at that time, marketing in general looked very different, and while guerrilla marketing is still used today, the ever-growing digital landscape is changing what it looks like. Again — you’ll see what that looks like in some of the examples below. What marketers really enjoy about guerrilla marketing is its fairly low-cost nature. The real investment here is a creative, intellectual one — its implementation, however, doesn’t have to be expensive. Michael Brenner summarizes it nicely in his article on “guerrilla content,” where he frames this style of marketing in the same context as repurposing your existing content, like taking certain segments of a report, and expanding each one into a blog post. It’s an investment of time, but not money, per se. In a way, guerrilla marketing works by repurposing your audience’s current environment. Evaluate it, and figure out which segments of it can be repurposed to include your brand. Outdoor Guerrilla Marketing. Adds something to preexisting urban environments, like putting something removable onto a statue, or putting temporary artwork on sidewalks and streets. Indoor Guerilla Marketing. Similar to outdoor guerrilla marketing, only it takes place in indoor locations like train stations, shops, and university campus buildings. Event Ambush Guerilla Marketing. Leveraging the audience of an in-progress event — like a concert or a sporting game — to promote a product or service in a noticeable way, usually without permission from the event sponsors. Experiential Guerilla Marketing. All of the above, but executed in a way that requires the public to interact with the brand. We know — without context, the whole idea of guerrilla marketing can be a little confusing, so let’s see how it’s been executed by a few other brands. Here’s a fun fact about your neighborhood marketing blogger: I. Spill. Everything. Coffee? Check. Olive oil? You got it. Generally, I am simply a mess, and like to have paper towels nearby at all times. Naturally, I couldn’t help but be impressed by this guerilla marketing installment from paper towel company Bounty. 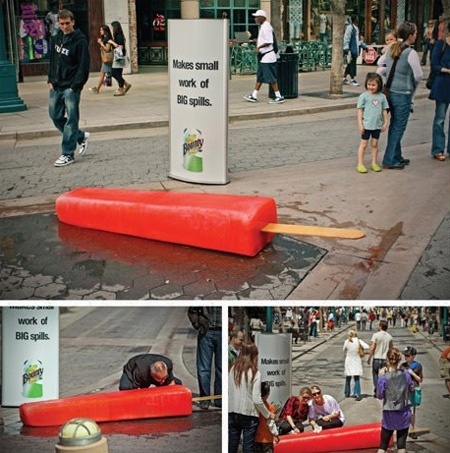 By installing life-sized “messes” throughout the streets of New York — a giant, knocked over coffee cup and a gigantic melting popsicle — the brand found a unique way to advertise its product and the solution it provides, with minimal words. You might ask, “Wouldn’t a concise billboard ad accomplish the same thing?” Well, not really. Culturally, we’re starting to opt for every possible way to eradicate ads from our lives. That’s why we love things like DVR and ad-free options on streaming services like Hulu and YouTube. This campaign, unlike an ad, isn’t as easy to ignore. After all, if you stumbled upon a melting popsicle the size of your mattress on your way to work, would you stop and look? We would. The big takeaway: Identify the biggest problem that your product or service solves. Then, find an unconventional way to broadcast that to the public — preferably without words. Okay, this one might not be entirely fair, since it wasn’t pulled off “in real life.” But how cool would it be if it was? To promote the nominees for its Album Of The Year category, the GRAMMYS music awards show created a video to show what would happen if posters for the nominated artists just began singing. It might sound impossible to actually carry out something like that. But imagine — what if you could create musical posters for your brand? Again, it’s different than a billboard ad, because when we walk by a wall of paper advertisements in, say, New York City, we don’t expect them to start moving. Now, we’ll admit that this idea isn’t exactly a budget friendly one, as it might require some technical work to bring to fruition. But even if you could include a single moving or digital image among a sea of still ones — in a place where it would come as a surprise, like a brick wall — it would catch people off guard and, therefore, get their attention. The big takeaway: Think about the things that your audience might just pass by every day — and make those things do something that’s both unexpected and interactive. When I first saw this photo, I’ll admit that I fell for it. “Someone, get that dog away from those flies!” I frantically thought. Then, I realized that the dog wasn’t real, and neither were the flies. The former was a photo, and the latter were actually humans. 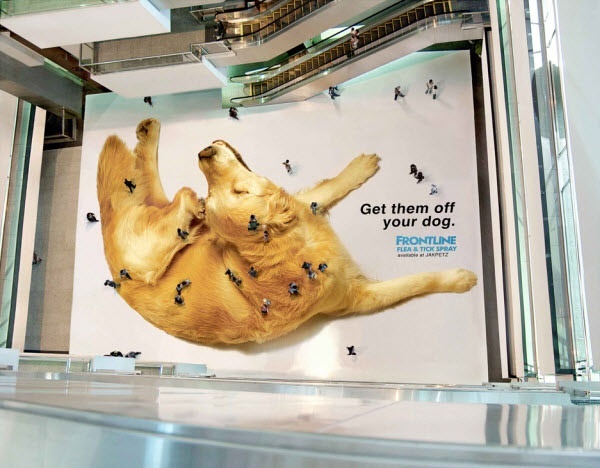 That’s because Frontline, the makers of flea and tick prevention products for dogs, were able to fill the entire floor of this large, public space with this image. The brand knew that many people walk across that space every day, and that a good number of people would also see it from the building’s upper levels, creating the dog-and-insect illusion. It’s hard to miss — and to not look twice. Again, this campaign is different than traditional marketing, because it’s not just plastering a single message somewhere that’s likely to be ignored. It creates a form of accidental human interaction that reminds the viewer what the product does. The big takeaway: Figure out how humans might involuntarily interact with your marketing messages. While your product or service may not address the issue of, say, insect removal, there are ways to make people part of the campaign. 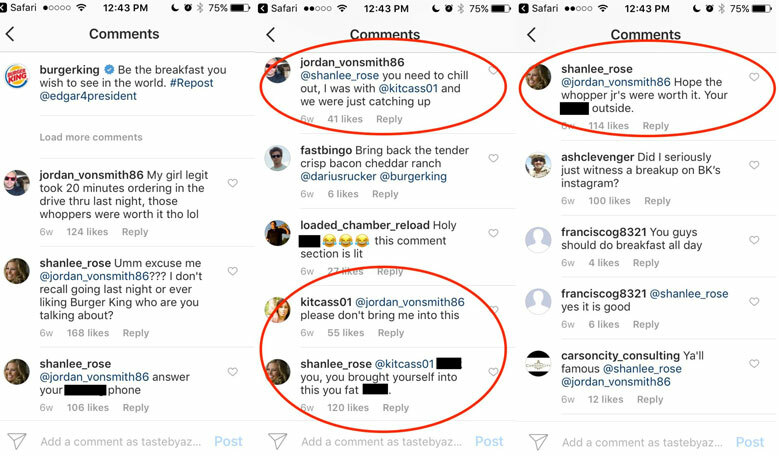 After the comments began to make headlines, many speculated that the entire exchange may have been staged by Burger King. And if it was, we can’t help but salute them — what a way to get your brand into the zeitgeist. 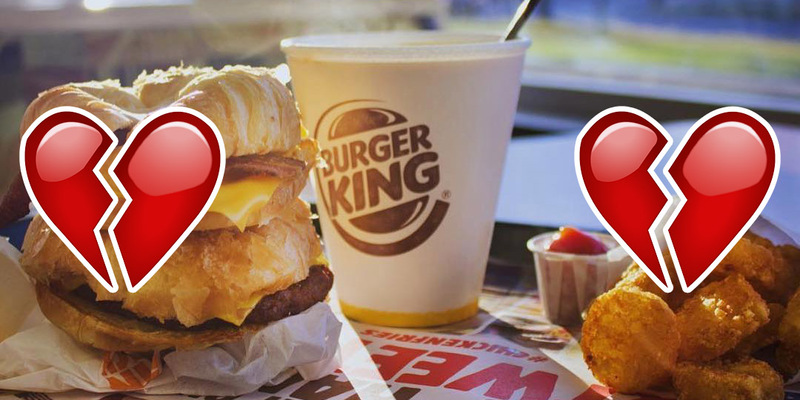 Burger King has roughly one million followers on Instagram. Compare that to the 2.1 million followers of its chief competitor, McDonald’s. And while we’re not sure how many followers the former had before this famous breakup, it makes sense to assume that this at least drew more attention to its social media presence, at least on this particular platform. People may have already been observing the brand on Instagram, but before now, were they actively discussing it? The big takeaway: Guerrilla marketing has gone digital. Think about where your audience already exists digitally — then, give ’em a show. While we can’t condone lying, we can applaud creativity, so don’t be afraid to use the comments to get people talking. I’m as guilty as anyone of wasting money on bottled water. I have no excuse. I have a reusable one. My workplace offers filtered water from a machine, not a traditional cooler, and yet, it remains a bad habit. That’s why this guerrilla marketing campaign from relief organization UNICEF resonated with me. It posed the question, “What if those bottles of water you waste money on were filled with dirty water?” It was a way of reminding the privileged masses that in too many parts of the world, entire populations have no access to clean drinking water. So instead of frivolously spending that money on bottled water, UNICEF suggested putting it toward efforts to bring clean drinking water to these areas. It did so by creating makeshift vending machines that sold bottled dirty water, with each button labeled as a disease caused by a lack of clean drinking water. The big takeaway: Guerrilla marketing works in the not-for-profit sector, too. And while scary, saddening images are often an impactful way of communicating your mission, there’s a way to convey it by creating something less in-your-face and interactive for the public. Are you an underwear company looking for an unconventional way to market your product? Why, just try placing an enormous pair of briefs on an iconic charging bull statue. Really, we can’t make this stuff up. It’s so simple, in theory, that it sounds like fiction. But when the GoldToe brand needed a way to tease and promote the launch of its new undergarments, that’s exactly what it did — casually placed these new items of clothing on statues throughout New York. And while we can’t be sure that it’s the route GoldToe took, we sincerely hope that those bull-sized briefs were made with leftover manufacturing fabric, helping to make this campaign even budget-friendlier. The big takeaway: Don’t overthink it. Sometimes what looks like your silliest idea might be the best one. When pub and brewing company Greene King feared that small, neighborhood establishments — notably, the pub — would start to be overtaken by large corporate retail, it launched a campaign to communicate just how important these local businesses really are. Even better, the content was almost entirely created by those who understand this predicament best: Pub owners, bartenders, and patrons. The big takeaway: It’s okay to get a little sentimental with guerilla marketing. Think about the emotions invoked by what you offer. Then, invite your audience to create content around what your brand means to them. Starting to make a little more sense? When we set out to write this post, we were disappointed with just one element of it — we found virtually no B2B examples. That doesn’t mean it’s impossible within that sector. It just requires extra creativity. Hopefully, you’ll be inspired by these examples, especially if you’re promoting a smaller brand. Don’t be afraid to crowdsource the content for these campaigns, for example — after all, it’s creative approaches to your work that help maintain guerrilla marketing’s budget-friendly, inbound nature. Remember: Catch people where they are, and insert your brand there. Don’t interrupt, but invite them to participate.